Brunswick stew, a tomato based stew with vegetables and meat, is a traditional dish popular in the American South. It's also surrounded by controversy. 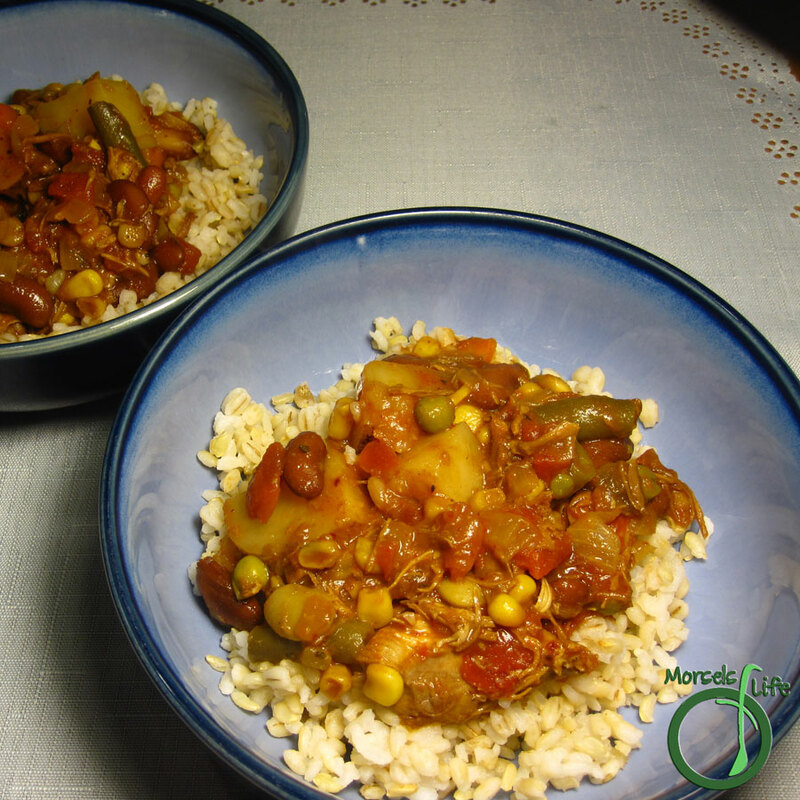 Brunswick Stew is a tomato based stew with vegetables (usually at least lima beans, corn, and okra) and at least one type of meat. However, there's quite a bit of controversy surrounding its origins and the proper ingredients. Some claim it's from Brunswick County, VA, others, Brunswick, GA, and yet others, Braunschweig, Germany. And then there's the Eastern NC style - thicker, with potatoes and a smoky flavor. Contrasting with Eastern VA, which is thinner, without potatoes, more tomato flavored, and less smoky. AND on top of all that - there's controversy over the proper meats. GA style usually uses beef and/or pork with squirrel, whereas VA uses chicken with rabbit, and NC uses chicken and pulled pork. Wow! That's a lot of controversy! What do you put in your Brunswick Stew? 16 ounces vegetables, chopped I used lima beans, carrots, green beans, peas, and I'm not sure what else. Throw all materials into slow cooker. Set for at least 1 hour. This sounds great! I love the kind of meals that you can throw in a crockpot and then serve! Thanks! Brunswick stew is very Southern. We love it at our house. I will be trying your recipe. Delicious. Come visit and check out our pumpkin fried rice and tomorrow a great dip. Be sure to visit on Friday. We are having a great giveaway from the Shabby Apple. Visit and register to win!